Nissan offers the front-wheel-drive-only Kicks in three trims. The Nissan Kicks is the affordable utility vehicle for first-time car buyers. 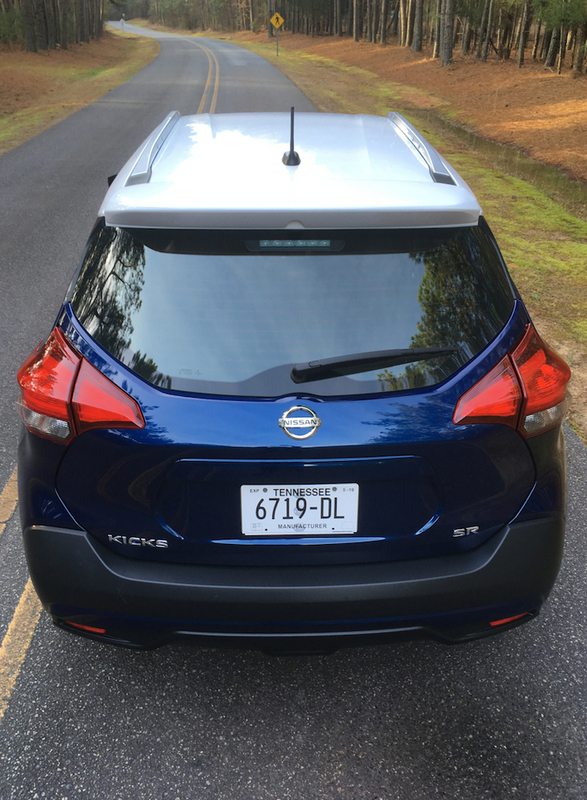 It does to the utility sphere what the Nissan Versa does in the car market, by providing a cost-effective model that blends style, utility, and comfort. With a starting price of under $20,000, the Kicks may convert not a few car owners to this Nissan utility. We covered the Kicks before, having taken delivery of a 2018 model last year and putting it through the paces. The model returns without major changes. However, we noticed it is slightly less powerful this year, but it is also more efficient than before. Nissan offers the 2019 Kicks in three trims: S ($18,540), SV ($20,250), and SR ($20,870). All models have front-wheel drive and come with a four-cylinder engine paired with a continuously variable transmission. If you want all-wheel drive, you’ll need to begin your small Nissan crossover search with the Rogue Sport. As for upgrades, Nissan keeps the Kicks’ factory-installed options to a minimum. Indeed, there is only one true package available as the other upgrades include various individual enhancements. The contrasting white roof supplies this Kicks with added panache. For instance, a set of 17-inch black alloy wheels ($495) are available. Further, you’ll find premium paint ($395), premium paint with two-tone body/roof ($595) and two-tone paint body/roof alone ($200). These upgrades are not available with the base S model. An SR Premium Package ($1,000) is available with the SV and SL trims. This package includes a special Bose Personal Plus sound system with the speakers embedded. Furthermore, there are various individual upgrades available through the dealership, including a rear spoiler ($360), illuminated kick plates ($370), and a Rockford Fosgate Audio system ($595). Since we just reviewed the Kicks just seven months earlier, we’ll go over the highlights of the Kicks this go around. Also, we’ve updated this model’s specifications, as listed at the end of this article. 1. Stepping up from a car isn’t a huge leap. We understand that crossovers cost more than cars. Certainly, that’s something manufacturers must address if they want to capture more first-time car buyers. In any case, Nissan has always had one of the least costly models on the market with its Versa sedan. The Versa starts out at about $13,500, which is a strong price point for a new car. You’ll pay about $6,000 more for a base Kicks, but it comes with a CVT and more standard amenities than the Versa. In particular, the Kicks is just $2,000 more than the Sentra sedan, a model that offers a better shopping comparison than the Versa. You won’t find navigation, but available smartphone connectivity will take you there. 2. You can’t get all-wheel drive. Most competing models in this segment supply standard front-wheel drive and available all-wheel drive. Like the Toyota C-HR, the Nissan Kicks is front-wheel-drive only. 2), the relatively light Kicks isn’t encumbered by additional running gear. 3. Fuel efficiency is a strong point. 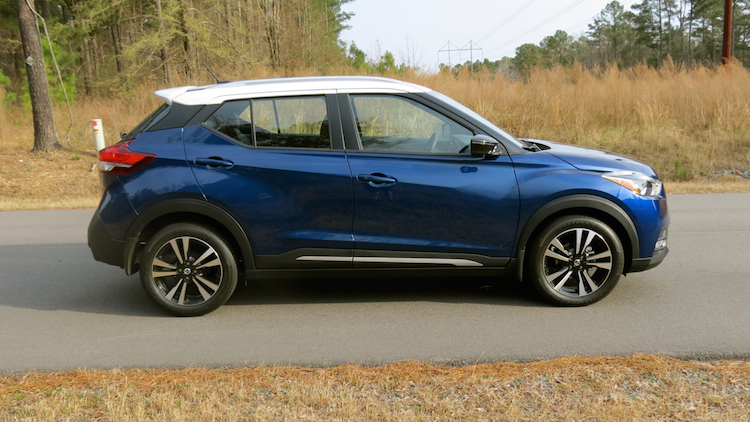 Speaking of weight, the Nissan Kicks weighs no more than 2,672 pounds. That’s 200 to 300 fewer pounds than such competitors as the Ford EcoSport, Jeep Renegade, and Honda’s HR-V. Combine its light weight with an efficient four-cylinder engine and thrifty continuously variable transmission, and you’ll enjoy excellent fuel economy for a utility vehicle. Indeed, at an observed 35 mpg, the Kicks beat the EPA-estimated 33 combined mpg for this model. In fact, that’s at least 5 mpg better than several other models in this segment, including the Chevrolet Trax and Hyundai Kona. 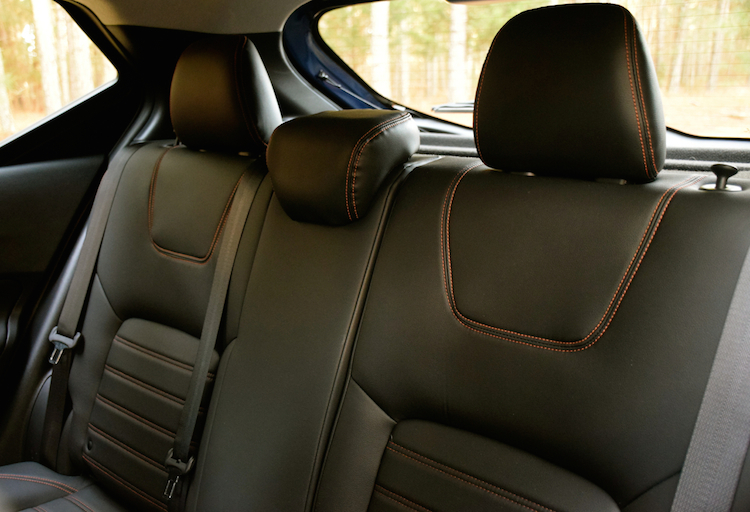 The available imitation leather seats feature double-stitched trim. 4. Cut above styling for the taking. The Nissan Kicks doesn’t scream budget. Far from it. Its exterior styling matches other Nissan models, including its take on the brand’s “V motion” grille. Our test model came dressed in two-tone blue with a contrasting white roof, delivering a sporty and an elegant take on this model’s look. The upswept beltline at the rear roof pillar is a nice touch too, something seen on more expensive models such as the Volvo XC40. Inside, the cabin offers a simple, yet attractive look. 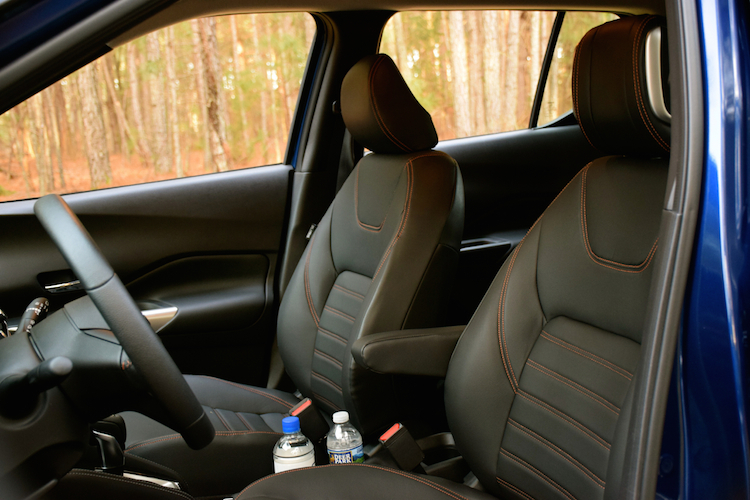 We noticed that the seat materials were an improvement over last year, then realized the optional “Prima-Tex” or imitation leather seats were the difference. You have to order the SR Premium Package to get them, but they’re worth it. Also, the package adds heated front seats. Nissan supplies the 2019 Kicks with a number of technologies, including three USB ports, Bluetooth connectivity, and Siri Eyes Free. You’ll also find Android Auto and Apple CarPlay smartphone compatibility and a 7-inch color touchscreen display. All models come with a rearview monitor and automatic emergency braking. Also available is blind spot warning, rear cross-traffic alert, and an around-view monitor. You won’t find adaptive cruise control or navigation with this model, as the latter is remedied by using smartphone connectivity to get you there. By and large we expect manufacturers to rely less on internal navigation in the future as ubiquitous smartphones manage that function. 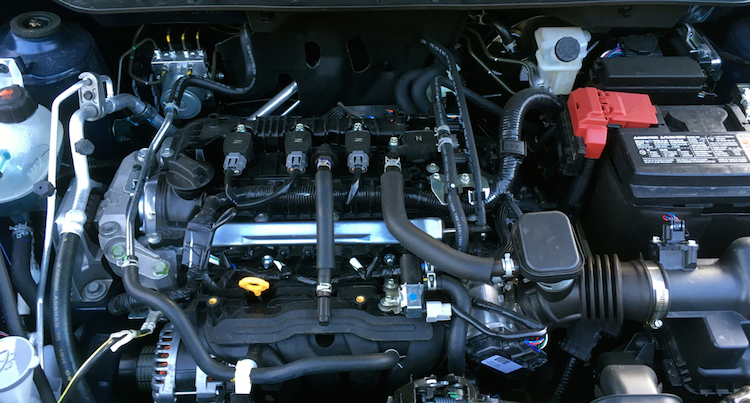 Power is down slightly this year from 125 to 122 hp and 115 lb.-ft. of torque to 114. The Kick’s fuel economy is unchanged. 6. Lots of room for its size. The Nissan Kicks seems large for its class. On paper, it seats five, although we think four is the ideal. Still, you can place three people side-by-side on the rear 60/40 split-folding bench seat in a pinch. Up front, the seats are comfortable, supportive and offer the kind of head, shoulder, hip and leg room we prefer. The rear seat may be tight for tall folk, but if you have two children in car seats, that space is nearly perfect. We like the standard cargo space, which measures 25.3 cubic feet or 53.1 cubic feet with the rear seat folded down. The Kicks’ seems positively cavernous compared to the previous Juke, which measures just 10.5 cubic feet behind the second seat and 35.9 cubic feet maximum. Further, the Juke’s rear seat was simply too tight for adult passengers. Shop for a 2019 Kicks and you’ll find a $2,330 price spread between the three trims. We suggest starting your search with the SV model as it upgrades the standard 16-inch steel wheels to 17-inch alloy wheels, adds heated side mirrors, and supplies smartphone compatibility. You’ll also find trim material upgrades, dual-zone climate control, keyless entry with push-button start, and a tonneau cover. 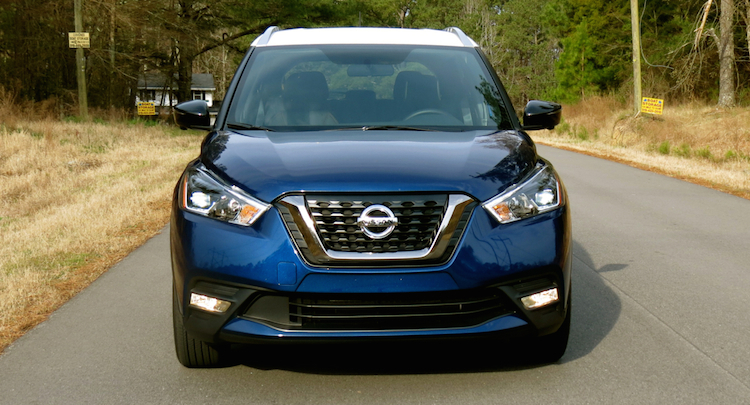 All in all, the Nissan Kicks delivers a very competitive model for the segment. It delivers nearly all the features consumers in a budget-friendly manner. A sizable cargo hold is another Kicks strong point. Nissan Kicks photos copyright Auto Trends Magazine. All rights reserved.